Scissor lift painting is notable among the work platforms available on the market for doing work with ease at heights that might otherwise be hard to reach by painters. It is also known as a table lift suitable for carrying loads or people to great heights. With a scissor lift, you can reach a two-story home or, in the case of the industrial services we offer, a high rise building or the top of a factory. This work platform comes with wheels that act like a forklift. The scissor lift is suitable for repair activities, painting and other aerial work. It will start to move upward once the criss-crossing support beneath the platform start to draw together and in the process pushes the lift upward. You can adapt the height of the scissor lift for painting to suit any painting task you want to do at any height. When extended, this work equipment can reach any height from 21 to 62 feet above the ground level; though the height any particular type of this work platform reaches depends on its size and purpose. When it starts to move upward, scissor lifting don’t move at a constant speed mainly because of its criss-crossing design. It stretches upward faster towards the middle of the height and slower when it extends more of its folding supports with bumpy ride as it stretches to the top. 1. It provides easy and stable lifting for the house painters that required to reach great heights that might otherwise be difficult to get at. 2. When operated according to instructions, scissor lifting is easy to move and work with. That minimises fatigue in workmen and raises their enthusiasm at work and level of productivity. 3. It reduces the need for workmen to bend and stretch repeatedly and, hence, eliminates the associated strain injury. 4. The design of the lifting device – the top to bottom criss-crossing scissor underneath a flat platform – allows any increase in the weight of the load on board its platform to be distributed consistently. 5. The scissor lift for painting has different models which are either mechanically propelled or powered by an electric motor or by hydraulics. So, different power system for different models allows a choice to be made depending on your requirements. 6. Scissor lifting comes with different base sizes, height, and platform sizes. Also, there are stationary and mobile scissor lifting Pro Painting Contractors can choose from. Therefore, different models with different capacities are available on the market. Painting contractors can choose a model based on capacities that range from standard to heavy duty lifting device and according to the need of the project environment. 7. Where necessary, turntables and tilters can be provided for workmen to move or tilt loads on the platform. That reduces the risk of injury that usually arises from lifting heavy loads. As beneficial as the scissor lift is for painting, repair and other aerial works, it can be dangerous if not used according to manufacturer’s instructions. Exercising due care is very important when working with a scissor lift. It is very important for operators of this lifting device to display professional attitudes that include having regard for personal safety and the safety of others. The need to obey guiding rules and procedures for using the device is very paramount. Before putting the scissor lift to use, carry out several checks to ensure a level surface around the working environment. Check for holes, drop-offs, ditches, bumps, and soft feel around the working environment and the possible path of travel and avoid them. 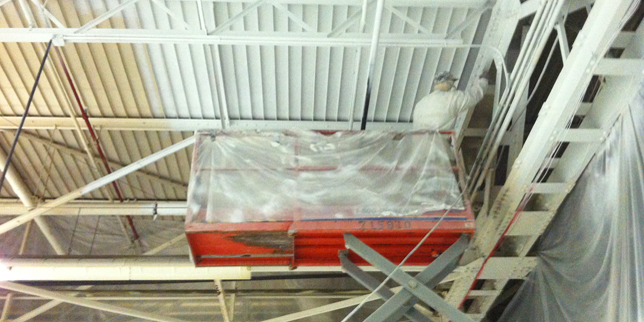 All types of hazards and obstacles must be cleared off the working environment or avoided because they can affect the safety risk associated with using a scissor lift for painting. Ensure there are overhead clearances. There is the risk of electrocution because the machine isn’t insulated. Therefore, keep it off from electric power lines, electric installations and electrically charged conductors. Avoid overloading the device beyond the rated capacity. When elevated, avoid driving the scissor lift close to moving vehicles or cranes and along sloping land areas. Don’t lean over the guardrails nor climb it. If the weather condition is windy, do not operate the lift. It is necessary for operators of the scissor lift for painting to be properly trained to handle the machine. After all working environment safety measures must have been taken, inspect the lift properly before mounting the platform. This is a major precaution required to make sure the machine is in good condition and working properly. 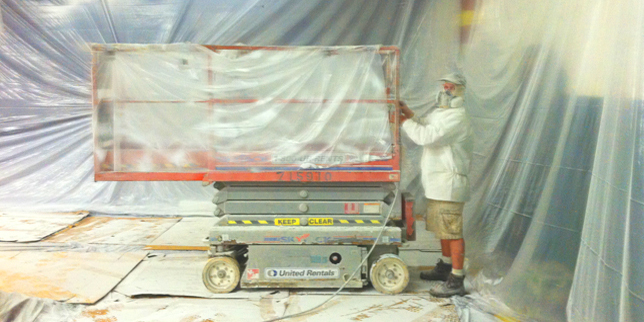 Learn more about scissor lift painting at PaintingContractorUSA.Com. This entry was posted in Aerial Work by Our Crew. Bookmark the permalink.